Wilderness is not just a place. It is also a concept that hides power relations. Erris, a region of County Mayo in the west of Ireland, has won the Irish Times award for the Best Place to Go Wild in Ireland 2014. But what does it really mean for a place to be “wild”? For many people, it is all about the view: enjoying “unspoilt” scenery and communing with nature. For others, it is about the experience of being distant from towns, cities, crowds, and the distractions of modern life. Sure, who doesn’t want to go wild? While it is now easy to market wilderness as something we are all eager to sample, the idea of Erris as a wild place comes with a lot of historical baggage. Wilderness is not just a place; it is also a concept that remains tied to imperialism. It is less a discovery of landscape than the creation of a commodity. The meanings of Irish wilderness were very different in the past when the perception of Erris as “the wildest district of Ireland” was one of the most consistent labels in travel writing about Ireland. When King Charles II granted some 95,000 acres of land in Erris to English businessmen in payment of debt, north-west Mayo was thought of as a wild, empty, and “unused” space. The idea was that under colonial improvement the landscape could be made picturesque and its “savage” inhabitants industrious. Such claims about transforming wild landscapes were part of a larger geographical imagination which designated Erris, along with Connemara, as the Irish “highland” zone, an area ripe for a communications revolution and the planting of civilised lowlanders. By the nineteenth century, colonial descriptions of the Mayo landscape as “nature in her undress” or nature “in tattered garments” continued to emphasise the helplessness, naivety and wildness of the region and its people. In the travelogues of Victorian tourists, Erris was imagined to be a paradox at the periphery of the Empire: a godforsaken place that was wild and sublime, but also occasionally picturesque and suitable for investment and immigration. If Mayo, with its poor land and lack of industry, represented a symbolic frontier zone for colonial improvers, then Erris was beyond the wild. An 1831 report to the Lord Lieutenant described Erris as a wilderness consisting of “vast tracts of boggy swamp, chiefly waste, interspersed with a few lakes and unculturable mountains”. For many Victorian tourists, the improvement of Erris was dependent upon the creation of picturesque landscapes by resident landlords. Binghamstown, a landlord village built by Major Denis Bingham in 1796, was frequently lauded by visitors. One described Bingham’s unfinished “noble castle” looking onto Elly Bay, which was “picturesque…of the boldest kind.” Bingham took his guest on a tour of the demesne and discussed plans for a covered greenhouse on the castle grounds which would provide a “pleasing winter-walk in this exposed site.” For Bingham, this gothic pile, with its front lawn stretching down to the sea, represented the starting point for a wider commercial development of the countryside around. The picturesque, though, was more than an aesthetic convention. By hiding the labour forces of the local inhabitants behind a pretty view, the picturesque was also political. Hence the frequent praise for landlords who managed to create estates in Ireland which were like “oases in the desert”. For most Victorian tourists there was a clear template of how Erris could be civilised. Woods, landscaped gardens, clean and respectable cottages, drained bogs, and the enlightened exploitation of the fisheries would transform Erris from a wilderness to an improved district. Trees played an important role in imagining this cultural landscape. This was an era in which the ideology of English landscape gardening presupposed significant modifications to the environment in the name of vistas and a “natural” look. In the connected practice of landscape painting, trees were symbols of cultivation and power; they performed the work of civilisation by beautifying the imperfect and disguising any actual agricultural work involving the peasantry. In building his castle at Elly Bay, Bingham sought to create a residence suitable for his imagined picturesque environment, yet the trees he planted only grew to the height of the wall of the estate due to the effects of sand. Indeed, the region was famous for its lack of trees. Writing in 1780, Arthur Young related the apocryphal story of a father and son who went to pay the rent in Killala and saw their first tree: “Lord, Father! what is that?” the son is supposed to have said. For those who failed to transform Erris, the wild environment and its wild inhabitants were to blame for its infertility. The lack of British settlers in Binghamstown meant that plans for trade and commerce were as stilted as Bingham’s trees. By the 1830s a boat-quay, mill, and market-house had all fallen into misuse. Almost nothing remains of Bingham’s castle today. Representations of the Erris landscape and its people continued to be negative until the Famine, when descriptions degenerated into a kind of apocalyptic lament. In 1847 the American missionary Asenath Nicholson described Erris as “a spot of all others the most wretched” and Belmullet as “the ‘fag-end’ of misery”. Quaker philanthropists who investigated conditions there found it hard to even express the horror of what they saw. A lot has changed in Ireland since the Famine. But one thing that has remained the same is the idea that Erris is a wild place. Instead of landlords arriving as beacons of picturesque progress we now have eco-tourists, ramblers, and surfers who seek out Erris precisely because it is a rough, boggy, place that stubbornly remained outside the grasp of colonial improvement. Yet the recent traumas of the Corrib gas project should remind us of the battles that are still taking place in Erris between different conceptions of what nature is and how it should be managed. Amid the spectrum of opinion on the controversy, some see empty space waiting to be developed, while others see wild beauty being put at risk. Holders of both viewpoints deploy the wilderness concept in their own way, hiding some parts of the world around them and revealing others. Going wild has always been a political act. 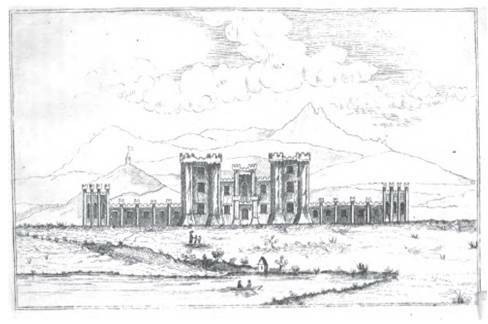 Binghamstown Castle (Source: P. Knight, Erris in the ‘Irish Highlands’ (Dublin, 1836), facing p. 68).